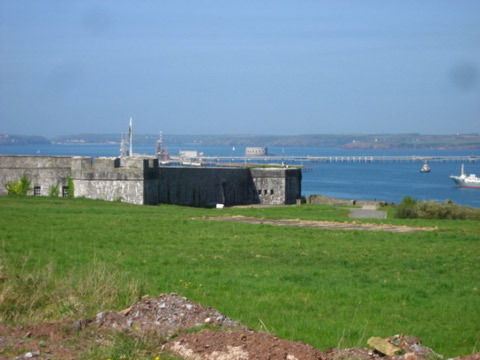 A six sided Palmerton fort completed in 1864 as part of the inner line of defence of Milford Haven together with Hibberston Fort on the opposite bank. It is comrised of two batteries, Moncrieff battery on the west side and Open Battery on the north. Abandoned at the start of the 20th century it was used again during the Second World War. Bought in 1957 by BP to be used as an oil terminal it was renovated but was closed to the public. It is now part of Texaco's Angle Bay Refinery.